If you want to know what happens when a society shifts rightward just turn on Alan Moore’s alternate timeline Watchmen and have someone punch you in the nuts. 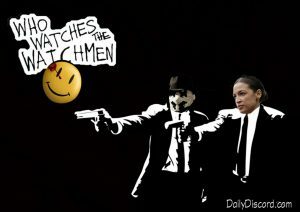 Then when someone asks Who Watches the Watchmen? you can say, “I do”, in a really high squeaky voice. Shortly after joining congress, Alexandria Oscia-Cortez channeled some Rorschach: “I am not locked in here with YOU! You’re locked in here with MEEE! !” Life mimics art and, according to Moore, art is knowing when you don’t need to be a hero anymore. On that note I’ve been wrestling with the prospect of throwing in the WordPress towel, or at least shifting The Discord’s focus to my other hobby interest, Australian rules cross stitch.